This book is written by a spiritual seeker and a motivational speaker. I have read the first book in the series and I loved it. You can check the review here. I loved that book. Anything that teaches some wonderful philosophies to live with, I tend to love them more. I received the second book from the publisher. 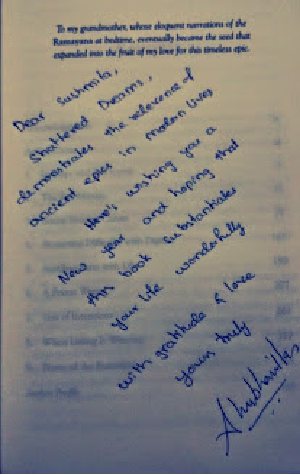 And the author sent it with an amazingly wonderful note, in coherence with the spirit of the book. The narration is even better than the previous one. Simple language which is easy to comprehend and can be related to - these are the characteristics of the wonderful narration of this particular book. Of course, the narration is pretty dramatic to keep the readers hooked to this book. This is a recount of the epic Ramayan. The story starts from where it ended in the first book, that is, the marriage of Ram and Sita. The book ends as the trio of Ram, Lakshman and Sita set foot in the forest. The book gives a wonderful detail of lives of the major protagonists. The flawless character sketch of Sita as a courageous woman and the excruciating details of Bharat's life as a devoted brother and a husband who decided to gave up on his temptations. The book has definitely given a perspective to help one inculcate the underlying teachings of this epic. As always, there are some wonderful lines, to which I could connect to. "Excessive lamentation is like tying to gulp hot tea. It results in a blistered tongue. One's lamentation for the past should not ricochet to destroy one's future." The only disappointment that this book brings is that it will force you to believe in good and evil. If a person is evil, he can not be given a second chance. This comes out very strongly in this book. I personally feel an alternative thought process is very important for a human being to evolve into a better person. A good read for people who enjoy this genre of reading.